Received: November 11, 2016; Revised: January 17, 2017; Accepted: February 2, 2017; Published online: June 30, 2017. Administration of autologous mesenchymal stem cells (MSCs) has been shown to improve renal function and histological findings in acute kidney injury (AKI) models. However, its effects in chronic kidney disease (CKD) are unclear, particularly in the clinical setting. Here, we report our experience with a CKD patient who was treated by intravenous infusion of autologous MSCs derived from adipose tissue in an unknown clinic outside of Korea. The renal function of the patient had been stable for several years before MSC administration. One week after the autologous MSC infusion, the preexisting renal insufficiency was rapidly aggravated without any other evidence of AKI. Hemodialysis was started 3 months after MSC administration. Renal biopsy findings at dialysis showed severe interstitial fibrosis and inflammatory cell infiltration, with a few cells expressing CD34 and CD117, 2 surface markers of stem cells. This case highlights the potential nephrotoxicity of autologous MSC therapy in CKD patients. Mesenchymal stem cells (MSCs) have been investigated in both preclinical and early-phase clinical studies as a therapeutic option for disorders such as myocardial infarction, osteogenesis imperfecta, and diabetes . In renal disease, MSCs have been investigated in experimental models for their immunomodulatory properties and paracrine functions . Several reports have substantiated the favorable effects of MSC therapy in acute kidney injury (AKI) models. However, based on results from the few existing reports on studies of chronic kidney disease (CKD) models and MSCs, the utility of MSCs in CKD is controversial . Even fewer reports exist of CKD models and adipose tissue-derived MSCs (ATMSCs). Moreover, to the best of our knowledge, autologous MSC therapy in a CKD patient has never been reported. ATMSCs have been used as novel sources of MSCs because they appear to have a higher proliferative potential, and more MSCs can be recovered from the same amount of tissue compared to that from bone marrow-derived MSCs (BMMSCs) . Here, we report a case in which autologous ATMSCs were used to treat a patient with CKD. A 33-year-old male patient initially visited an outpatient clinic of Kyungpook National University Hospital in Daegu, Korea in September 2011. Eight years before the initial visit, he had been diagnosed with focal segmental glomerular sclerosis (FSGS) at another hospital, based on clinical and renal biopsy findings. The biopsy revealed 8 normal-looking glomeruli and no segmental sclerosis. The tubulointerstitium was well preserved and showed no fibrosis or inflammatory cell infiltration (Fig. 1). Initial treatment with prednisone for 8 months was discontinued because of steatohepatitis. Although the treatment was changed to mycophenolate mofetil, he showed poor compliance to the drugs and the degree of azotemia gradually increased. When the patient visited our hospital for the first time, in September 2011, serum chemistry revealed elevated blood urea nitrogen (BUN) of 38.1 mg/ dL (normal, 6–20 mg/dL) and creatinine (Cr) of 4.5 mg/ dL (normal, 0.9–1.5 mg/dL). The estimated glomerular filtration rate (eGFR), as calculated by the Modification of Diet in Renal Disease (MDRD) study equation, was 16.0 mL/min/1.73m2. In November 2011, without discussing it with us, the patient traveled to a foreign country and received ATMSC therapy for his CKD. Autologous MSCs were harvested by abdominal liposuction, isolated from the removed adipose tissue, and then cultured in vitro in preparation for the treatment. The stem cell preparation was later injected intravenously into systemic circulation. He received 1 injection, and the number of MSCs infused was 4.0 × 108 cells. No additional MSCs were administered. Additional details about this treatment were not available. Serum chemistry performed 1 week after MSC therapy revealed BUN 69.2 mg/dL, Cr 8.99 mg/dL, and eGFR 7.3 mL/ min/1.73m2, with no other evidence of AKI. The clinical course showed rapid deterioration of preexisting renal insufficiency, rather than improvement in renal function, and the patient started hemodialysis 3 months after autologous MSC therapy (Fig. 2). Five months after the MSC therapy, a renal biopsy was performed to establish the cause of the rapid deterioration of renal insufficiency. The biopsy specimen was evaluated by morphological analysis with periodic acid-Schiff staining, immunohistochemistry for CD34 and CD117, 2 known hematopoietic stem cell (HSC) surface antigens, and electron microscopy (EM) . All glomeruli were completely sclerotic. The interstitium showed diffuse fibrosis, severe tubular atrophy with some compensatory dilatation, and massive infiltration of mononuclear cells (Fig. 3). Immunohistochemistry revealed that some of the mononuclear cells were positive for CD34 and CD117. The endothelial cells along the capillaries and glomeruli were positive for CD34, and the regenerating tubular epithelial cells in the compensatory dilated tubules were also positive for CD117 (Fig. 4). However, despite these areas of regeneration, the patient continued on hemodialysis without recovery of renal function. The renal repair mechanisms following MSC therapy are thought to be transdifferentiation, cell fusion, and paracrine activity [4,6]. The functions of MSCs in renal regeneration and repair are owing mostly to their effects on paracrine actions, although transdifferentiation and cell fusion may occur. The paracrine effect of MSCs is due to their effect on regenerative and inflammatory processes. Several proangiogenic factors are produced by MSCs . Therefore, the paracrine effects of MSCs may improve the status of regional vessels and promote tissue regeneration. In the biopsy tissue from our patient, histological examination showed that the regions undergoing regeneration were positive for CD34 and CD117 expression. CD34 is an exclusionary marker of MSCs, and some of the CD117-positive infiltrative mononuclear cells in the biopsy were identified as mast cells by EM. Thus, the observed regeneration of tubule structures and angiogenesis might have been due in part to the paracrine effects of the administered MSCs, such as HSC recruitment and stimulation of endothelial progenitor cells (EPCs), rather than MSC engraftment. MSCs may reverse fibrosis and repair injured renal structures by generating growth factors . Renal fibrosis may be associated with epithelial-mesenchymal transition (EMT), in which epithelial cells acquire the characteristics of mesenchymal cells and differentiate into myofibroblasts, which then contribute to renal fibrosis. Kalluri and Weinberg  suggested that blockade of EMT by MSCs could reduce renal fibrosis and slow the progression of chronic disease. However, another study showed that the infused MSCs may induce EPCs to differentiate into myofibroblasts and thus induce renal fibrosis . Thus, the immunomodulatory effects of MSCs in renal fibrosis are controversial. Our patient’s clinical course showed rapid deterioration of preexisting renal function after MSC infusion. It is possible that the rapid progression of renal fibrosis might have led to the reduction in residual renal function. Thus, MSC infusion might have aggravated renal fibrosis rather than reduce it. In our patient, the MSC marker CD117 was present on the surface of regenerating tubular epithelial cells. These regenerating cells might have arisen via transdifferentiation or cell fusion with either endogenous stem cells or infused MSCs. However, we were not able to determine the origin of these CD117-positive cells. Few studies on MSC therapy in experimental CKD models have reported improvements in renal function and histological findings [11,12]. Kunter et al  noted that MSCs infused into the arteries of rats contributed to the regeneration of endothelial and mesangial cells; Alexandre et al  reported lower serum levels of creatinine and a reduction in proteinuria. However, another study showed no benefits for renal function; Semedo et al  demonstrated that although injection of MSCs into veins reduced transforming growth factor-β levels, it failed to improve long-term renal function. Clearly, the role of MSCs in CKD is controversial. In our patient, although we did observe some regeneration of renal structures in the biopsy tissue, most of the tissue showed features of renal fibrosis. In addition, the progression of CKD was not ameliorated. On the contrary, the eGFR of our patient rapidly decreased from 16.0 to 7.3 mL/min/1.73m2 1 week after MSC injection, and hemodialysis was initiated. The deterioration in renal function and the histological finding of minor regeneration but predominant fibrosis could be explained by maldifferentiation of the multipotent stem cells recruited by the paracrine actions of the infused MSCs. It is possible that CKD itself may induce stem cells to differentiate into smooth myofibroblast progenitor cells (SPCs) over EPCs, leading to an imbalance in the EPC/SPC ratio. The increased number of SPCs could then differentiate into greater numbers of myofibroblasts that, in turn, could induce renal fibrosis. Ultimately, an EPC/SPC imbalance could accelerate the loss of renal function and progression of renal fibrosis. In addition to the reduction in the number of EPCs, CKD may also be associated with EPC dysfunction and impaired EPC recruitment, which would also contribute to the progression of renal fibrosis and further deterioration of CKD . Several animal studies with CKD model showed somewhat beneficial effects of MSC therapy. 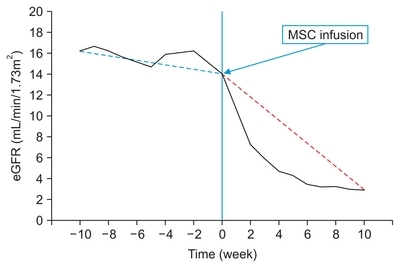 However, any definitely beneficial result about MSC therapy with human CKD patients has not been reported and a clinical trial is ongoing about the safety of MSC therapy and their efficacy in treating CKD . Although the International Society for Cellular Therapy (ISCT) provided recently some information related to the use of MSC therapy, there are no standard guidelines concerning of the clinical methods for MSC therapy. Our case report has a limitation that we have no specific data about MSC preparation. But we can assume that the patient did not have qualified MSC injection and the non-standardized therapy could be more harmful to the CKD patients. Considering that there has not been definitely beneficial result and standard guideline about MSC therapy in human CKD, we should be more careful in introducing MSC therapy and need more safety data from the study with qualified preparation process of MSC. In conclusion, despite recent advances, MSC-based therapy for CKD has not yet been shown to be safe and effective. Although preclinical studies have failed to show consistent results, and indeed, some have clearly shown negative results, MSC-based therapies for CKD are currently available in clinics that are not subject to regulatory purview. MSC-based therapy for CKD should be deferred clinically until its safety and efficacy has been established. This research was supported by a grant of the Korea Health Technology R&D Project through the Korea Health Industry Development Institute (KHIDI), funded by the Ministry of Health & Welfare, Republic of Korea (grant number: HC15C1129). Fig. 1. (A) Periodic acid-Schiff staining did not reveal any specific pathology in the glomeruli or tubulointerstitial areas. Immunohistochemical staining revealed that the peritubular vessels, including the glomerular capillaries, were positive for CD34 (B) and negative for CD117 (C). Magnification, 200×. Fig. 2. The estimated glomerular filtration rate (eGFR) of our patient rapidly decreased from 16.0 to 7.3 mL/ min/1.73m2 after mesenchymal stem cell (MSC) infusion. Dotted lines show the trend in the eGFR before (blue) and after (red) MSC infusion. Fig. 3. (A) Glomeruli were completely sclerotic, and the interstitium showed diffuse fibrosis, inflammatory cell infiltration, and associated severe tubular atrophy (periodic acid-Schiff staining, 200×). (B) The interstitium was mostly replaced by fibrosis (blue); the right lower quadrant shows globally sclerotic glomeruli (tri-chrome staining, 400×). Fig. 4. Some mononuclear cells along the interstitium were positive for CD34 (A, arrows) and CD117 (B, arrows). Magnification, 200×. Le Blanc, K, and Ringdén, O (2007). Immunomodulation by mesenchymal stem cells and clinical experience. J Intern Med. 262, 509-525. Patel, SA, Sherman, L, Munoz, J, and Rameshwar, P (2008). Immunological properties of mesenchymal stem cells and clinical implications. Arch Immunol Ther Exp (Warsz). 56, 1-8. Little, MH, and Rae, FK (2009). Review article: Potential cellular therapies for renal disease: can we translate results from animal studies to the human condition?. Nephrology (Carlton). 14, 544-553. Reinders, ME, and Rabelink, TJ (2010). Adipose tissue-derived stem cells: can impure cell preparations give pure results?. Nephrol Dial Transplant. 25, 3805-3807. Pode-Shakked, N, Metsuyanim, S, Rom-Gross, E, Mor, Y, Fridman, E, Goldstein, I, Amariglio, N, Rechavi, G, Keshet, G, and Dekel, B (2009). Developmental tumourigenesis: NCAM as a putative marker for the malignant renal stem/progenitor cell population. J Cell Mol Med. 13, 1792-1808. Caldas, HC, Hayashi, AP, and Abbud-Filho, M (2011). Repairing the chronic damaged kidney: the role of regenerative medicine. Transplant Proc. 43, 3573-3576. Zacharek, A, Chen, J, Cui, X, Li, A, Li, Y, Roberts, C, Feng, Y, Gao, Q, and Chopp, M (2007). Angiopoietin1/Tie2 and VEGF/Flk1 induced by MSC treatment amplifies angiogenesis and vascular stabilization after stroke. J Cereb Blood Flow Metab. 27, 1684-1691. Ninichuk, V, Gross, O, Segerer, S, Hoffmann, R, Radomska, E, Buchstaller, A, Huss, R, Akis, N, Schlöndorff, D, and Anders, HJ (2006). Multipotent mesenchymal stem cells reduce interstitial fibrosis but do not delay progression of chronic kidney disease in collagen4A3-deficient mice. Kidney Int. 70, 121-129. Kalluri, R, and Weinberg, RA (2009). The basics of epithelial-mesenchymal transition. J Clin Invest. 119, 1420-1428. Broekema, M, Harmsen, MC, van Luyn, MJ, Koerts, JA, Petersen, AH, van Kooten, TG, van Goor, H, Navis, G, and Popa, ER (2007). Bone marrow-derived myofibroblasts contribute to the renal interstitial myofibroblast population and produce procollagen I after ischemia/reperfusion in rats. J Am Soc Nephrol. 18, 165-175. Kunter, U, Rong, S, Djuric, Z, Boor, P, Müller-Newen, G, Yu, D, and Floege, J (2006). Transplanted mesenchymal stem cells accelerate glomerular healing in experimental glomerulonephritis. J Am Soc Nephrol. 17, 2202-2212. Alexandre, CS, Volpini, RA, Shimizu, MH, Sanches, TR, Semedo, P, di Jura, VL, Câmara, NO, Seguro, AC, and Andrade, L (2009). Lineage-negative bone marrow cells protect against chronic renal failure. Stem Cells. 27, 682-692. Semedo, P, Correa-Costa, M, Antonio Cenedeze, M, Maria Avancini, Costa, Malheiros, D, Antonia dos Reis, M, Shimizu, MH, Seguro, AC, Pacheco-Silva, A, and Saraiva Camara, NO (2009). Mesenchymal stem cells attenuate renal fibrosis through immune modulation and remodeling properties in a rat remnant kidney model. Stem Cells. 27, 3063-3073. Goligorsky, MS, Kuo, MC, Patschan, D, and Verhaar, MC (2009). Review article: endothelial progenitor cells in renal disease. Nephrology (Carlton). 14, 291-297. Peired, AJ, Sisti, A, and Romagnani, P (Array). Mesenchymal stem cell-based therapy for kidney disease: a review of clinical evidence. Stem Cells Int, 4798639.